Investigations into potential pathogens and causes of the outbreak are complex and ongoing. It was first documented off Virginia Key, near Miami, in an area that is chronically stressed by a number of factors including unfavorable water quality. Scientists and resource managers are coordinating interventions and treatments with the goal to slow or stop the spread of stony coral tissue loss disease. The most urgent needs are at the disease front in the Lower Keys. Strategies include colony-specific interventions to prevent mortality of the most important corals, efforts to reduce the pathogen load, and salvage of selected colonies to prevent the loss of the diversity and genetic structure of the corals. In April 2019, FORCE BLUE divers working with scientists from Nova Southeastern University are completing a 50 day dive mission to treat diseased coral colonies in the Florida Keys. Veterans with the nonprofit organization utilize their unique skills to apply antibiotic and chlorine treatments on diseased corals in the Florida Keys National Marine Sanctuary. The experimental treatments, funded by the Florida Department of Environmental Protection, aim to save priority coral colonies and provide scientific insight into stony coral tissue loss disease. As a bonus, the work also provides former combat divers with a new mission – saving Florida’s coral reefs. A team of scientists out of Nova Southeastern University lead by Brian Walker, have been assessing and treating coral disease of the 60 largest, healthiest corals from Pompano Beach to Key Biscayne. After one year of monthly monitoring, it appears that there could be some periodicity of new disease infections. The number of required treatments s varied by month. The highest number of treatments were in June, right after the onset of the rainy season (May) and rose again in August and September, the warmest water periods. The number of new treatments has steadily dropped since early 2019. Also, the number of newly infected colonies followed a similar pattern with the highest number of newly infected large corals in May and August. There have been no newly infected large corals since November 2018, leaving 22 large monitored corals that have resisted infection to date. Shown is a diseased great star coral fragment A) untreated diseased fragment, B) untreated after 11 days, C) treated with probiotic McH1-7, and D) treated with probiotic McH1-7 after 11 days. The living tissue is a brownish color that is slowly lost over time. While efforts continue to identify the pathogens responsible for stony coral tissue loss disease, scientists are also testing the theory that probiotics may bolster coral resistance and recovery. Researchers with the Smithsonian, University of Florida, and University of Hawaiʻi are using healthy corals taken from Florida waters to develop probiotics that could slow or prevent disease progression. They isolate potentially beneficial microorganisms (probiotics) from more disease-resistant coral genotypes and test them on great star coral (Montastraea cavernosa), one of the species most susceptible to stony coral tissue loss disease. Preliminary results suggest that these good bacteria on healthy corals may help defend their host from infection and that they are a plausible treatment for diseased corals. The next steps are to run more tests to try to optimize treatment and to determine if it can protect healthy corals from disease transmission. This would be essentially for protecting captive corals rescued from disease-impacted areas. In early 2019, response teams accelerated efforts to rescue corals from ahead of the advancing disease front in the Lower Florida Keys in an effort to maintain biodiversity for future restoration efforts. As part of the Coral Rescue Plan, 90 corals were transferred on December 19, 2018, from Keys Marine Lab in Layton, Florida, to the Florida Aquarium’s Center for Conservation. Since their original collection of 177 corals in September and October 2018, Florida Fish and Wildlife Conservation Commission staff have successfully cared for the rescued corals at KML with more than 99 percent remaining healthy. Colonies of 11 species were transported by FWC and Florida Aquarium staff to the Apollo Beach Conservation Center where they will remain until longer-term housing is available at Association of Zoos and Aquariums facilities nationwide. The unprecedented network of holding/housing facilities includes immediate, post-collection holding at Keys Marine Lab with Florida Aquarium, Mote Marine Lab, University of Miami, and Nova Southeastern University currently providing intermediate holding facilities. In 2018, Dr. Brian Walker of Nova Southeastern University and his team of students and scientific divers treated large coral colonies (those greater than 6.5 feet across) threatened by the disease outbreak in Southeast Florida. These corals are the oldest living residents and the main reef builders of the region, providing great benefits to marine life and people alike. Dr. Walker's project can be credited for saving dozens of these important colonies from succumbing to stony coral tissue loss disease. In 2019, Dr. Walker's group will collaborate with the teams of Dr. Joshua Voss at Florida Atlantic University’s Harbor Branch Oceanographic Institute, Miami-Dade County, and Broward County to expand the efforts to identify, monitor, and treat diseased coral colonies of all sizes. This collaboration will involve the testing of novel intervention approaches and technologies on corals all along the southeast Florida coast and will include the opportunity for citizen scientists to assist in the monitoring of treated corals. Following antibiotic treatments on Oct. 21, 2018, monitoring continues of diseased corals at Looe Key with volunteers with DiveN2Life, a non-profit organization providing youth with the experience and education to influence environmental change. Two student divers are collaborating with scientists by photographing the treatment sites on a regular basis. Looe Key is a popular diving and snorkeling site in the Lower Florida Keys where stony coral tissue loss disease remains very active. Disease-resistant corals are being studied for restoration efforts. In laboratories throughout Florida, gene banks preserve species that could potentially be grown and transplanted along the reef. Coral Rescue – Healthy corals of the susceptible species collected and stored in land-based facilities to maintain diversity in restoration projects. 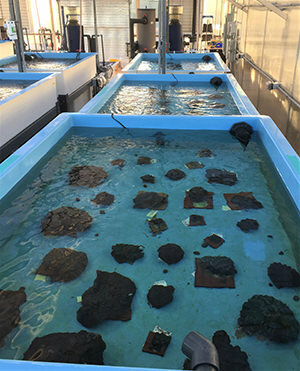 Mote Marine Laboratory on Summerland Key developed a micro-fragmentation and fusion method to speed the growth of brain, boulder and star corals - crucial reef-building species known for their slow growth in the wild. The Florida Aquarium and conservation partners have embarked on an Florida coral reef conservation mission in the Florida Keys to introduce and ‘outplant’ more than 3,000 new genotypes of staghorn coral (Acropora cervicornis) to protect and restore coral reefs in the region from the brink of extinction. Although staghorn coral is not affected by stony coral tissue loss disease, it is a keystone coral species necessary to maintain healthy coral reef ecosystems in coastal Florida and the Caribbean.